My family is awesomely supportive of me. What can I say – they’re awesome! 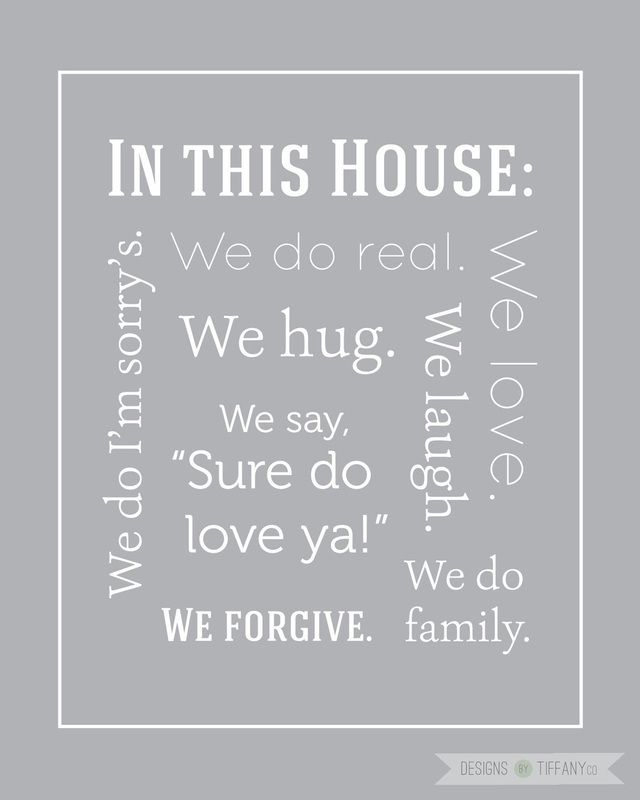 And after Allie wanted a poster, my mother-in-law also asked me to design a print of family rules for her home. I’ve never done a poster like this with the words going in different directions, so it racked my brain for weeks until I finally got it to work and look good. David helped me tweak some things to really make it perfect. What would I do without him!? And thanks, Ellen, for asking me to do this. I had a lot of fun and I’m glad you love it! I know this prints out as anonymous, but this is Ellen, and I LOVE this gift from Tiffany! I told her I liked classic colors, like gray, and that I trusted that she would come up with a design that was just right….. and it is! In our family, we always said "Sure do love ya!" after family prayer, and I love having that be part of this piece — It makes it special for all of us. Tiffany, you are wonderful!